Ten years on from the landmark 2006 edition of the IDS Bulletin that brought us the ‘powercube’ – a practical approach to power analysis that offered a way of confronting its complexity – we return to the question of how to analyse and act on power in development. This issue focuses on the ways in which invisible power can perpetuate injustice and widen inequalities. Articles call for ways to denaturalise norms and structures of social, political and economic inequality – tackling injustice, misrecognition, poverty, disenfranchisement – so that the universal aspirations of the Sustainable Development Goals may have a chance of success. Contributors discuss the ways in which economic and political modes of inequality interact with social inequalities such as gender, race or sexuality to create yet more inequality, confronting policymakers with a challenge. 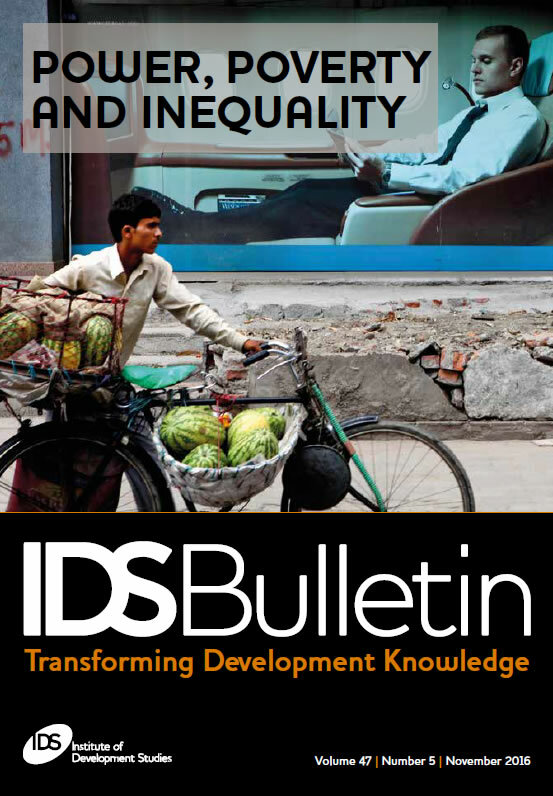 Such complex social inequalities become ‘normal’ – but the contributions in this new IDS Bulletin offer ways of untangling complexity using approaches to analysis which take account of multiple dynamics in unequal relations. Articles suggests means by which tacit understandings of what is bearable, useful and fair can be brought into question. The SDG call to ‘leave no one behind’ – which will only be achieved through breaking the vicious circle of inequality – is more than about policy, increased action, or creating alternative economies. It is also about changing norms of what is possible, and making visible those invisible norms that have hindered our ability to imagine and create a just world. Intersectionality: A Key for Men to Break Out of the Patriarchal Prison? Glossary: Power, Poverty and Inequality.